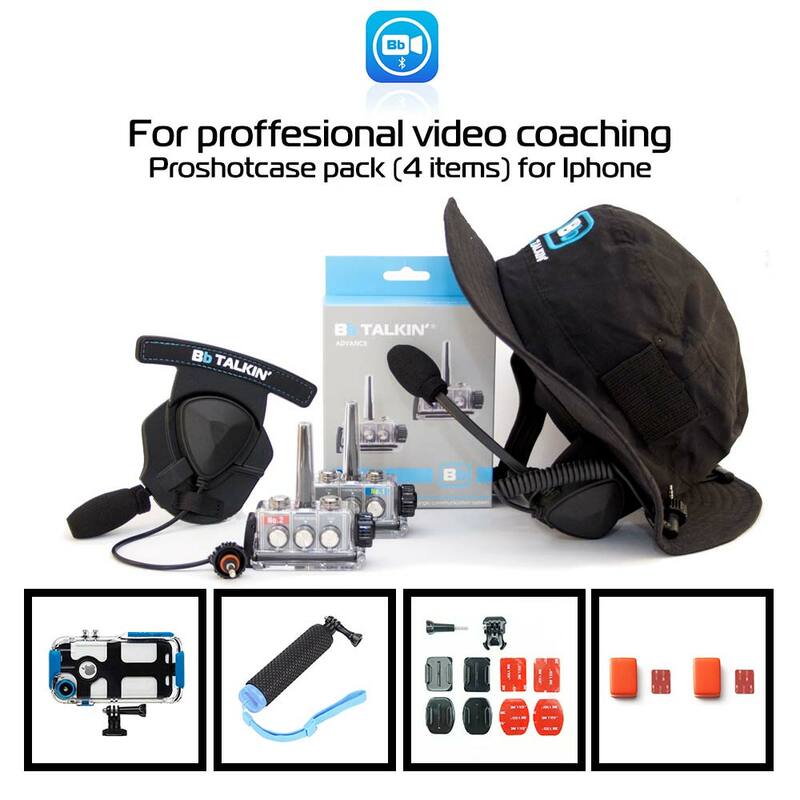 The special video pro 2-way pack is a pack for 2 people who want to record conversation. Ideal for coaching with video. All your recorded video will be included with the audio sound of the BbTalkin when you pair your smartphone. This pack contains the Proshotcase for iPhone only. The high waterproof case protects your iPhone for all water from outside. 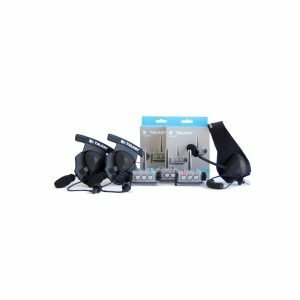 All headsets are IPX7 approved (exept wake/cable headset) and so is the Proshotcase. The package has a standard mono helmet speaker pad (B02R) for the rider. 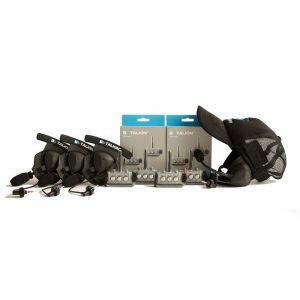 You will have to choose what headset you want to wear as instructor. 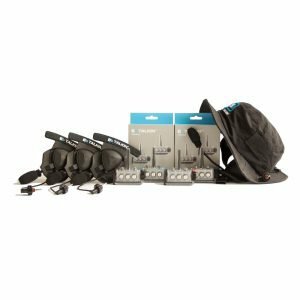 The Surf Cap (Bo1CR), the Surf Hat (Bo1HR), the Sports Headset (B01R) or combine with the wake/cable non-waterproof headset (B06C). Make sure you choose the right iPhone case to go with your iPhone (options: 7, 8, 6+, 7+ and 8+). We will include the Proshot grip, Proshot mounts and Proshot floaties so you can start recording immediately. The BbTalkin advance is the only waterproof bluetooth communication system in the world. You can pair up to 6 people max and talk to your friends, listen to music or take a call. When you pair with your smartphone. 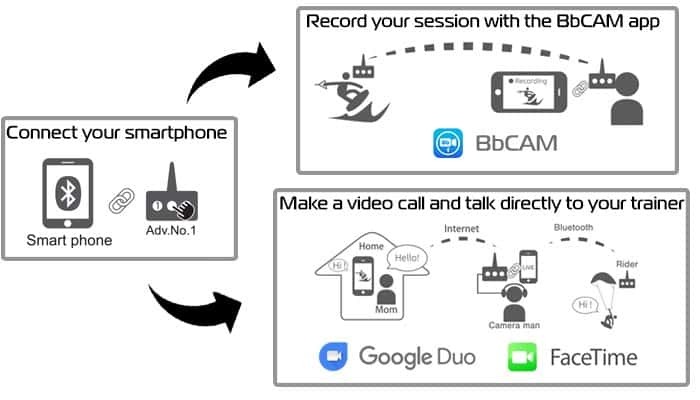 You are able to record the conversation with the special BbTalkin Cam App or make a video call and connect to instructors and friends all over the world. BbTalkin will help in many cases. Instruction on the water, communication during water rescue, safety for industrial workers on the job, stay in contact in the snow on the mountain, ride together downhill on your mountainbike, train your students for horse riding, motorcycle or motorcross, use for wakeboard, flyboarding or soaring the dunes with your paraglide. The functionality is very versatile. In many cases communication is important and so is your safety and progression. Especially when you are a instructor or coach. After using BbTalkin you will never want to go without. It is important to understand that Bluetooth only works in line of sight. Meaning you have to see the other intercom without any object blocking it’s way. Even turning your head is an obstacle for bluetooth. The less obstacle you have the more distance the system can cover up to 1600m. Place your device as high as possible for best quality in connection. Standing on a dune or cliff gives you the best result (1600m). The lower you are to the ground the less distance you wil have. This is the first rule for getting as much distance as possible. If you are standing on the beach you will never have the maximum possible distance. Placing the intercom higher on the body increases the signal and distance. We always recommend to use the highest mounting position available. If the student goes low to the water with the intercom, signal strength will go down and you loose distance. When you submerge the intercom under water (with the arm mount for example) connection will be blocked, because the intercom is not in line of sight. 3 PEOPLE OR 4 PEOPLE CONNECTED? The limit is 1600m in total. When you divide the distance per intercom you will have less distance the more you attach. 1600:3=533 and 1600:4=400m. It seems to vary between 100m and 500m when systems are close. It also depends on how you link your BbTalkin intercoms. Since we have the advance upgraded. It’s even possible to add up to 6 total in the group conversation. Remember to check how your devices are connected and how you maintain the best connection. 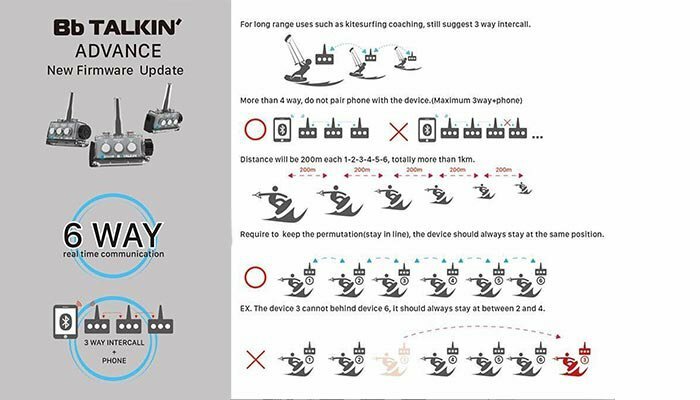 Take notice from the fact you are now dividing 1600m over 6 intercoms. 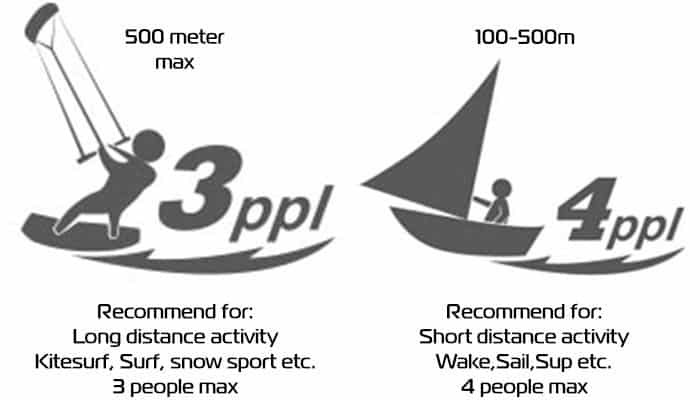 1600/6=266m (200m recommended) will be your max distance between users. Connect your smartphone to your Advance intercom and make it interact with your smartphone. Take a call, listen to music, make a video with the BbCam App downloaded from the apple store or Google. It’s even possible to make a video call to someone that is at home behind a computer. In this situation you can train your riders from anywhere in the world or show your friends your new trick in real time. 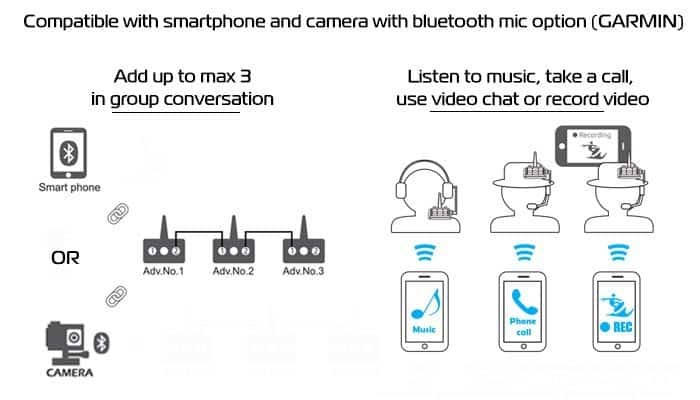 When connected with your smartphone you are able to connect max 3 advance intercoms in the group. After this, it’s not recommended to use these additional functions. You can also use any camera that has bluetooth microphone option available. A good example is the Garmin sports camera that has these function. Unfortunately GoPro Hero does not support bluetooth connected microphones and thus we are not able to pair with GoPro. 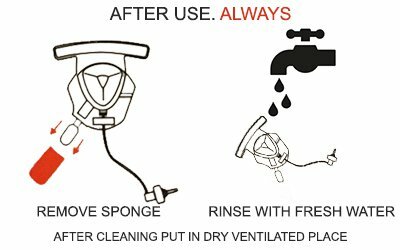 Make sure you clean and rinse your headsets with fresh water every day after using. Your device is being used in harsh conditions (UV sunlight, warmth, cold, moist, salt, water and sand). Before your rinse the headsets. Take of the mic sponge. After rinsing your equipment, dry all helmet pads and mic with towel before taking the intercom out. 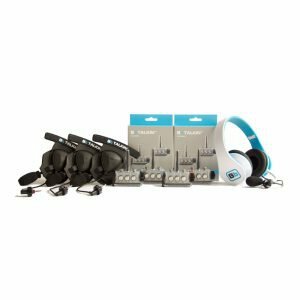 Place all wet headsets and accessories in a well ventilated dry room. Make sure they dry as much as possible (don’t dry in direct sunlight). Always take the intercoms out of the case and keep them away from any moist coming from other equipment. Make sure your equipment is dry inside when installing. read more information about trouble shoot, warranty, maintenance, how to do’s and instruction videos and other topics in ‘support’ and ‘how does bbtalkin works’ in the menu above. © 2017-2018 Copyright BB Talkin Netherlands – Schylgemedia. All rights reserved.